I would be challenged to remember the last time I saw any business receive as much support while out of business as Indian Joe Brewing (2123 Industrial Court, Vista). The family-run operation abruptly shut down when it lost its base of operations to landlord disputes in 2015. Owners Max Moran and Geri Lawson immediately got to work looking for a new spot to install their brewery, but it took a while—two years to be exact. In a county with more than 140 operating brewhouses, there’s little reason for even the most devoted of beer-drinkers to hold a candle for the return of one of the smallest of the suds scene’s sojourners, but hundreds of Indian Joe fans remained just that…fans. Not the casually interested kind, but the most engaged breed of supporters, communicating with the owners over social media and in-person when possible, following them as they sought out a new facility and, after finding it, took on the task of not only reopening, but growing the business by leaps and bounds in the process. The result is the current iteration of Indian Joe, which opened in March and is fulfilling the long-entertained dreams of Moran, Lawson and the many hopeful beer enthusiasts crowding their corner. During the lengthy road to Indian Joe 2.0, I also stayed close to the business’ founders, visiting the project site and wondering just how much of their ambitious agenda they would actually be able to realize. Installing a 15-barrel brewing system, an extensive stainless steel cellar, tons of oak barrels for aging and a huge tasting room; taking over an abutting building for warehouse space; distributing throughout the county in kegs, bottles and cans. 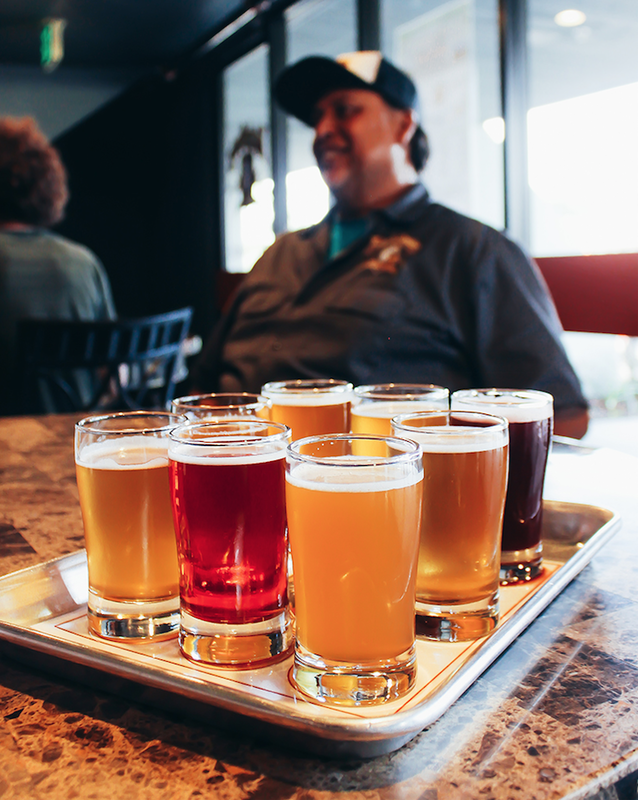 Keep in mind, they were coming from a business-park brewery where Moran brewed several times a day on a meager 20-gallon system simply to keep beer on-tap at the sole source of consumption, Indian Joe’s tasting room. It was nicely appointed and featured many an outlandish brew that, frankly, weren’t for everybody. It wasn’t exactly the type of operation one would figure to be ripe for financial backing and expansion, but Moran and Lawson easily secured enthusiastic financing to take things to the next level. While permitting and construction of their new spot proved much more difficult, a recent visit reveals they’ve accomplished many of their goals and are on-track to breathe life into the rest. Indian Joe has a whopping 30 beers on-tap. That’s admirable—but only if the beers are of quality. Quantity is nothing without quality. After tasting through more than half of the offerings the day I was there, I can say that Indian Joe’s beers taste better than at any point in the company’s history. What makes that even more impressive is the range of styles and the retaining of the anything-goes approach that birthed oddities like a Margarita Gose aged in tequila barrels; blueberry, plum and ginger sour ale; and honey-oatmeal tripel with Vietnamese and Ethiopian Baraka Buna coffees. What to the beer-purist (and even some adventurous drinkers) sounds like a rundown of the tap-list at an insane asylum…wait for it…tastes rather nice. Sure, you have to be in the mood for something avant-garde, but I often am and enjoyed all three of these beers in addition to an “imperial red sour” with blackberries and black currants, “Indian Sunrise” blood orange and sweet cherry Gose and apricot-peach sour. All three are ideally suited for the hot-weather months just around the corner. But not all of the beers are weird at Indian Joe. There’s a Belgian-style witbier (which also comes infused with lime or tangerine), a robust porter (another version of which is available spiked with chocolate and hazelnut) and a variety of IPAs, including a double, a flagship infused with white sage and, to show they can fall in line with the best of them, a Northeast-style number for the haze-crazy. The IPAs are better than the ones I remember from the original Indian Joe. The increase in overall quality isn’t just the result of purchasing new, larger, more state-of-the-art equipment. 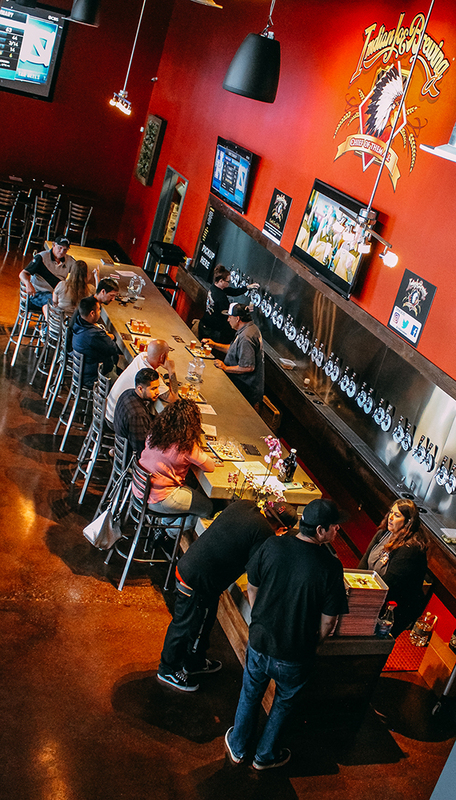 Moran and Lawson brought on a head brewer, Grant Heuer, who last brewed at Temecula’s Refuge Brewery and Relentless Brewing as well as Las Vegas’ Big Dogs Brewing. In addition to bringing experience, he has also brought brewers and brewing ingredients from Riverside County (where he still resides) to the table, resulting in collaboration beers (including that hazy IPA created with Electric Brewing) and the java from Augie’s Coffee utilized in the aforementioned out-there tripel and Indian Joe’s imperial oatmeal coffee stout. Also upgraded is the environment in which the beers can be experienced. Indian Joe’s 4,000 square foot tasting is one of the largest in the county. 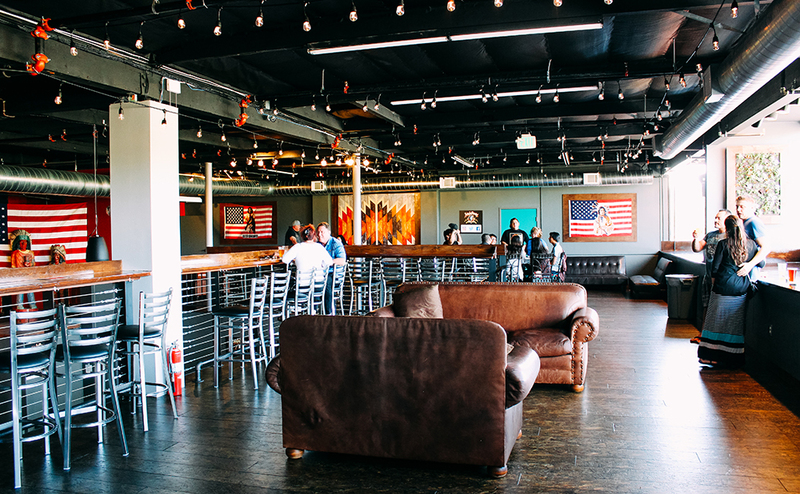 Visitors can drink at the long downstairs bar, high-tables or an outdoor patio…and that’s just the ground floor. There’s an L-shaped upstairs area with windows looking out onto State Route 78, a rail bar and numerous plush leather couches. Moran and Lawson clearly made the most of all the time they spent waiting on agencies to respond and construction issues to be resolved. The immense amount of time was worth it and the faith in these entrepreneurs from their loyal fans well placed.